While attached character is attacking or defending alone, Mare in Heat gains: "Action: Kneel Mare in Heat to choose a participating character with STR higher than that of attached character, and remove that character from the challenge." Mare in Heat must be attached to a Knight character. During setup, it must be attached to a printed Knight character -- you cannot combine it with the Knighted attachment during setup on a non-Knight. The "Knight" only play restriction is also checked constantly. 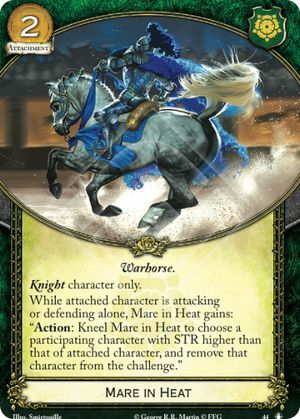 So if, during the game, you combine with the Knighted attachment to give Mare in Heat to a character that isn't a printed Knight, and then the Knighted attachment is discarded or removed (due to Confiscation, etc), Mare in Heat will also be discarded.